Have a look at this picture of New Zealand’s rarest stamp – see anything unusual about it? It’s a bit hard to see because of the post marks but the centre scene is actually upside down. It’s known as the Taupo Invert and it’s the only survivor out of the 80 incorrectly printed stamps. 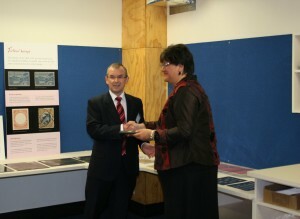 The stamp was formally presented to Te Papa by New Zealand Post’s Chief Executive, Brian Roche, today. The stamp will be immediately available to researchers, and will feature prominently in a book on the 1898 pictorial issue which is currently being written. It will also take pride of place in future philatelic exhibitions, both at Te Papa and potentially in the wider community. 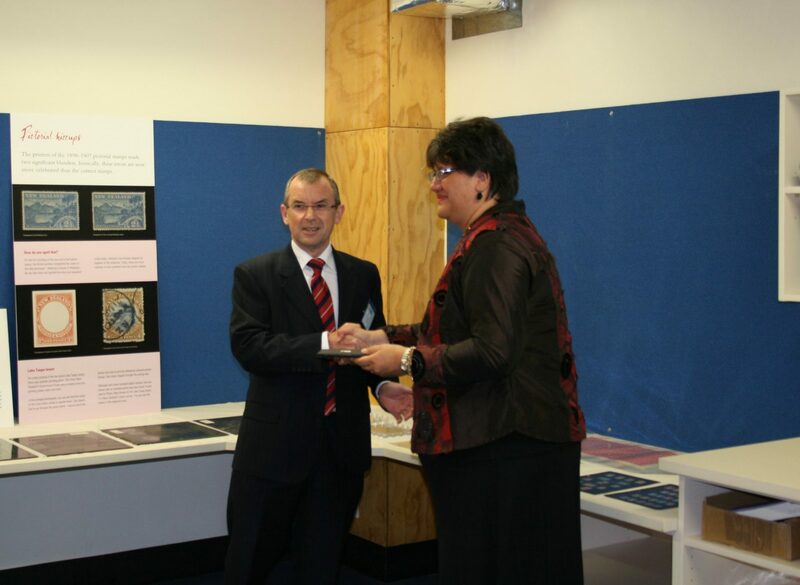 Brian Roche, NZ Post's Chief Executive, hands the Taupo Invert stamp to Te Papa's Acting Chief Executive and Kaihautū, Michelle Hippolite. Photo reproduced courtesy of NZ Post Group. The image was originally printed in 1898 as part of a 14-stamp pictorial issue showing a variety of New Zealand scenes. In a 1903 re-issue, a single sheet of 80 Lake Taupo stamps was incorrectly printed when the sheet was passed through the printing press for the second stage the wrong way around. The error was not discovered until 1930 when a farmer in England came across it while searching for stamps in his childhood album to sell for cash during the Great Depression. A year later it fetched £161 at an auction in London – a large sum at the time. 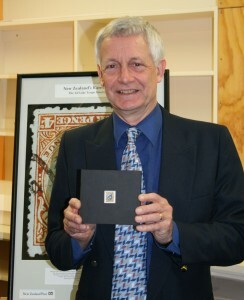 Dr Patrick Brownsey, Te Papa's stamp curator, holding the Taupo Invert. Image reproduced courtesy of NZ Post Group. It was then sold to the Marquis De Rosny and did not reappear for sale until 1980 when it was sold to an American buyer by French stamp dealers for 110,500 francs (then about US$18,000). It was subsequently referenced at a number of international shows and in sales lists until finally, in 1998, it was purchased by New Zealand Post for a record $125,000 to coincide with a centenary commemoration reprint of the 1898 pictorial issue. At Te Papa, the stamp will form part of an existing collection representing the 170 years history of the New Zealand Post Group. I enjoyed the article but do take issue with the statement made in the second paragraph directly under the stamp. “The only known copy discovered to date”, or something similar. I collect postal stationery from the revolutionary period of Indonesia (1945-1949) and there are still new discoveries being made of extremely rare items from this period (where as few as two examples of some of the issues have been recorded to date). To categorically state that this stamp “is the only sole survivor” out of the 80 originally printed is wrong, unless of coarse you can document the destruction of all the other 79 copies. Can the author confirm all other 79 copies of the inverted center variety were destroyed, leaving just this single copy in existence? Saved as a favorite, cool web page! how much do some rare stamps sell for? RARE – when this term is used it means that the item comes on the open market rarely and is usually highly sought after when offered for sale. The number of copies known to exist is small (usually less than around 50 copies) and the provenance of each copy is often known. When rare stamps come on the market there is usually a lot of interest from collectors who want to add the item to their collections and prices can be in the 10’s and even 100’s of thousands of dollars. In exceptional circumstances prices can top the $1Million mark. Rarity and high price do not always go hand-in-hand. Ultimately the price will be determined by how sought after the item is. So a rare stamp from one particular country with a small collector base may sell for $5,000 but from another country with a large base of interested collectors, a rare stamp may fetch many $100,000’s. SCARCE – This term can be used for stamps that are generally available in the market place but can sometimes be hard to find. In other words it may take some time to search out a copy but there are always copies available in the market place available for purchase. Scarce stamps can cost from a few $1’s up to $1,000’s, again depending on the country and the general level of interest from collectors. I have the same stamp,only its the right way up. 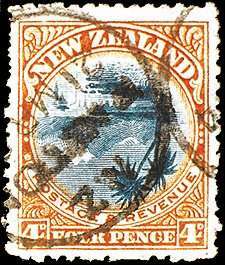 The original 1898 pictorial stamps were printed in London, but subsequent issues were printed in New Zealand. A number of changes were made to the original colours of the 1898 pictorial stamps for a variety of different reasons. One of these was that the Universal Postal Union required that all halfpenny, penny and twopenny halfpenny stamps be printed in green, red and blue respectively. When these changes were made in New Zealand, the green sixpenny kiwi stamp could potentially be confused with the new green halfpenny stamp. It was therefore decided to change the six penny stamps from green to pink. So the change was quite deliberate and not due to lack of green ink!! I am a German collector of errors of classical philately and I have a question concerning the local printing of the pictorial series of 1899-1900. Do You know why there was a color change from green to red of the 6d Kiwi value in 1900 ? I am writing an article about color-errors and I am potentially interested in the reason. Do the printers ran out of the originally green color ? It would be a major surprise if another example of the Lake Taupo invert turned up after this length of time, and it would need to be carefully examined to make sure it wasn’t a forgery. If another genuine example were found, it would add an extra dimension to the story and might even enhance the value of both stamps. However, the “value” of the stamp at Te Papa is purely historical because it will never be sold on the open market, whereas another one in public ownership would potentially have real monetary value. I have read the article you have above, and am wondering how much of a surprise it would be if there were another Lake Taupo invert stamp in circulation. If another stamp has survived will this devalue the one you have on display or will it be more valuable as it is NOT owned by NZ Post? I would be very interested in a reply! You’ll find all the info you need in the blog post above. Is this the stamp from 1903 showing Lake Taupo and Mount Ruapehu upside down? Answer fast, please, I have a homework question on the rarest nz stamp. why does anyone want to know about a stamp? Can the poster size of this stamp be purchased at Te papa?